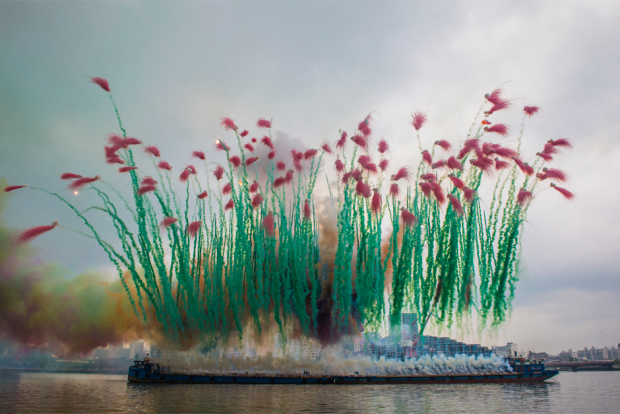 Red and green pyrotechnics explode as part of ‘Remembrance,’ part two of ‘Elegy: Explosion Event for the Opening of Cai Guo-Qiang: The Ninth Wave,’ on the riverfront of the Power Station of Art gallery, Shanghai, August 8, 2014. New York City-based artist Cai Guo-Qiang, one of the most celebrated contemporary artists born in China, has become the Godfather of a spectacular new kind of fireworks displays which he calls “explosion events.” Having done large-scale events around the world, from Beijing and Buenos Aires to Doha and Hiroshima, he has taken “gunpowder,” one of China’s “four ancient inventions” (printing, paper, the compass, and gunpowder) and pioneered a new epic form of art that is both material and metaphoric. “Why is it important to make these violent explosions beautiful?” he asks. “Because the artist, like an alchemist, has the ability to transform certain energies, using poison against poison, using dirt and getting gold.” For Cai, the challenge is to take a force that historically has been viewed as destructive and transmogrify it into one that has curative artistic properties and is constructive. Cai explains that one reason he started working with fireworks was that he wanted “to open a dialogue with the universe,” jokingly suggesting that the real audience demographic he sought was not mortals here on earth, but “extra-terrestrials” in outer space. Having grown up as a child in the coastal city of Quanzhou in Fujian province, just across the Straits from Taiwan, Cai became accustomed to hearing explosions as Mainland artillery batteries traded fire with Nationalist batteries on Kinmen and Madzu, two offshore islands then under the control of Chiang Kai-shek’s Government. But, it was only after he went to Japan and became interested in science that he found the opening, as he describes it, to a “window between the mystical, metaphorical, metaphysical concepts of Taoism—the infinity of mind within us and that of the physical universe whose seemingly infinite dimensions outside us were being mapped by astrophysicists.” Indeed, it was in pondering the Big Bang that Cai began to see that every molecule of existence actually found its common origin in this moment of creation. It was also while studying in Japan that he became aware of the terrifyingly destructive forces of physics that had been released through nuclear weapons at Hiroshima and Nagasaki. But if Cai’s fascination with pyrotechnics had roots in weaponry and physics, over time they also evolved to have a curious affinity with traditional Chinese brush painting. While at first these two mediums seem utterly dissimilar, Cai’s daytime “explosion events,” such as the one recently launched on the Huangpu River in Shanghai in front of the Power Station of Art to mark the opening of his solo exhibit, “The Ninth Wave,” suggest haunting similarities with classical brush painting. Involving organic vegetable dyes rather than just gunpowder, the smoke from these “explosion events” slowly blurs in the air much the way ink from a brush stroke is absorbed by rice paper in traditional painting. Thus, Cai’s unique brand of daylight skywriting bespeaks at once of his deep traditionalism and his modernism.